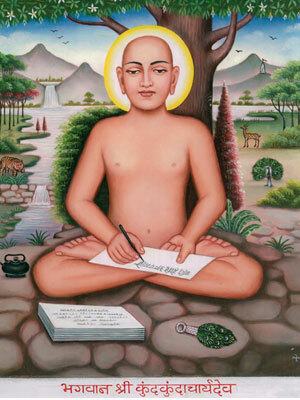 The great spiritual saint Kundkundacharyadev occupies the highest place in the tradition of the Jain acharyas. He is remembered immediately after Bhagwan Mahaveer and the preceptor Gautam as an auspicious blessing. Every Jain recites the couplet with the three adorable, everyday reverentially before starting the study of religious texts. Jain monks feel honoured in being included in the tradition of Kundkundacharya. Jain community is as unacquainted with the life of Kundkundacharyadev, as it is acquainted with his name and glory. Always resting in the depth of the soul and away from worldly fame, Kundkund has nowhere written anything about himself. Merely his name has been mentioned in Dwadshanupreksha. Likewise, he has described himself in Bodh Pahud as the disciple of scriptural sentient Bhadrabahu, who had the knowledge of Twelve Anga Scriptures and who had spread the message of the Fourteen Purvas. Though writers afterwards have referred to him with faith and reverence, which throws light on his greatness, yet no particular knowledge about his life is obtained. "If Padma Nandi Nath (Kundkundacharyadev) had not distributed the divine sentience obtained from Seemandhar Bhagwan amongst the Sadhus, how could they realise the real path of liberation?" His real name is Padma Nandi and is known as Kundkundacharya being a resident of Kundkundpur. Samaysar, Pravachansaar, Panchastikay, Niyamsaar, Ashtapahud, Dwadshanu-preksha and Dash Bhakti. Rayansar and Moolachar are also said to be his works. It is said that he wrote eighty-four pahuds. It is also said that he wrote a commentary named Parikarma on the first three parts of Shat-khandagam, which is not available. Samaysaar is the great unique treatise of Jain spiritualism. Pravachansaar and Panchastikay have detailed description of the Jain principles. The above three are also known as Natak Trayi, Prabhrit Trayi and Kundkund Trayi. Acharya Amritchandra has written elaborate commentaries on the three in the Sanskrit language. Commentaries of Acharya Jaisen in Sanskrit are also available.